Posy: Quest to meet Chris! As I've been doing my painting over these last few days I've had had my CD player on constantly (I just can't work without music, can you?) and have had my most loved songs playing. This of course means Coldplay and I thought I would tell you about the position 'Chris' holds in our family! Firstly, I want to stress that I am perfectly sane in most aspects of my life, but I find my admiration for Coldplay (particularly lovely Chris) leads me to do things that a 42 year old woman/mother should maybe think twice about. 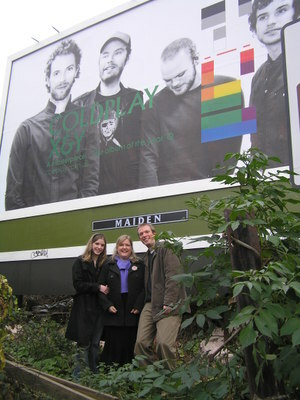 Take last Boxing Day..
A few days before Christmas I had noticed this billboard go up in our town...I told my brother Matthew , who is another Coldplay fan, and we had decided that on our annual Boxing Day walk along the beach we would stop and have our photo taken with our heros. Well, this is the nearest we would ever get to them! It wasn't quite as simple as we had thought and it took a lot of climbing over rather dubious piles of dumped rubbish! We got some rather funny looks too. But hey, what a photo opportunity! I had thought about making my own calender and taking 12 changes of clothes for each month! Matthew, is my youngest brother and he is a doctor (should know better too!) He and I are very close and share the same sense of humour..and spend our time laughing. He lives in Winchester so we speak on the phone regularly and recently he told me about another quest to meet our hero. This time I wasn't able to join him but this story really makes me laugh! Coldplay were playing at Abbey Road Studios and Matthew & I had entered a competition - numerous times - to win tickets. We didn't. Matthew decided to go and wait outside, you know like a 35 year old doctor usually does! He spent hours in the cold being jostled by the press and slowly the band arrived separately. He was able to get 2 autographs but still wasn't sure if Chris had arrived. Suddenly a huge black car drew up and out got Chris...Matthew says that he had an overwhelming urge and he found himself shouting as loudly as he could..CHRIS..CHRIS!! He didn't even turn around.. he probably thought that it was the press shouting. "Still," I said to Matthew trying to be positive "at least he had heard your voice!" What makes me laugh is him yelling "Chris!" He doesn't know what came over him. We laugh together and think up ways that we might get to meet him - the latest is in Matthew's clinic in his hospital he might put up a notice saying, 'If anyone knows Chris Martin could they report to a member of staff!' or ask everyone of his patients! Seriously, I hope you know that we are only joking. But - if you happen to know Chris...!! I could go on and on and you have been very patient with me. It's funny to get to the grand old age of 42 and feel so passionately about certain music. And yes, last December at their concert in Earls Court, it was me who found myself suddenly shouting, "Chris! Chris!"